Tag Archives for " Anita Campbell "
Now that pretty much everyone on the planet gets the importance of content marketing it’s time to throw a wrench in the works. To remain effective with your content marketing efforts you must constantly evaluate, change and evolve! I know you may not want to hear that, but content only provides value when it’s useful and the consumer always determines what useful looks like. As more and more content marketers experiment with content form, length, frequency, mode, delivery, and style the consumer pallet for content continues to mature and evolve and you must do so with it. I’ve been participating in content marketing for about fifteen years now, long before we called it that, but I’ve always tried to stay in touch with the wants and needs of the reader. My first efforts were articles placed in directories and shared in an ezine. (How’s that for some nostalgia) In 2003 I started blogging here and that’s driven a great deal of my growth for over a decade. Over the years my email newsletter has become more of a place to filter, aggregate and share other people’s content in snack sized versions. I produced my first eBook in 2004 or so and now feature ten, including some I’ve licensed from other writers. We now feature guest blog post two and sometimes three times a week and I contribute blog style articles to about a dozen publications on a regular basis. Social media has obviously opened new doors in terms of sharing and generating new forms of content. 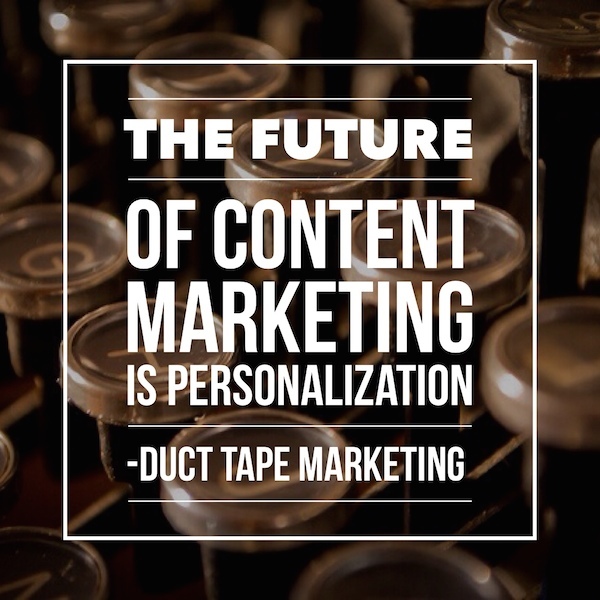 I believe the future of content marketing, however, rests in our ability to evolve to a more personalized form of creation and delivery where the end reader participates in the curation and creation of the content they request from marketers. This next step will require even more from content marketers if they are to continue to deliver value in an saturated field of more and more content. I reached out to some well-known content marketers and asked them to share how their content marketing thoughts had evolved over the last few years. Their responses are both fascinating and informative. Online content strategy has changed over the last couple of years. The focus is still on providing value, but this has been honed even further. I see businesses being more strategic about the type of content they publish online, to build the communities they want. There’s more long term strategy in the content they produce. I see businesses blogging less often but with deeper content to create strong evergreen content relevant to their business. I see others sharing more thoughtful pieces of content to connect with the right people. A few years ago providing value might have been enough to get traction to impact your business, but it’s also very important to create the type of coherent online visibility you need to establish relationships. Combining the two is essential today. There’s just too much noise, too many people publishing the same thing. And of course you need a visual marketing strategy to go hand in hand with your written content if you want to really take advantage of social media reach today. Different people in your target audience (whomever that audience may be) have varying preferences for content format, platform, approach, etc. I always knew this to be true, but in the past two years I’ve really embraced the concept that there is no such thing as all-powerful content. No magic bullet. No reliable home runs. Consequently, I’m striving to create more and more content types native to more and more content platforms, so that there is something from me in the style and format that’s preferable to each person in my tribe. That’s why I’m doing more podcasting, videos, ebooks, slideshare and just about everything else. Instead of trying to do one thing extraordinarily well, I’m trying to do many things very good. It’s not easy, but content can’t fully succeed as the tip of the spear – you need the whole spear. In the last two years, I have changed my ideas about blogging. I used to do more video posts with tutorials but I’ve switched to posting very long text posts with a lot of screenshots as my primary blog post and then occasionally add in video posts. I’ve found that having a lot of screenshots is great for people who are scanners. Even though my video posts were usually around 3-5 minutes in length, not everyone wants to sit through them. My blog posts are typically between 1000-2000 words which is much longer than I used to write when I had written posts. I’m also focusing this year on posting 2-3 times per week on my blog rather than just 1 time per week. It doesn’t always happen but I do like when I can post more often because it allows me to post a little more variety of content. I can post one in-depth technical post about Facebook or social media, and then also post something slightly different about business motivation or more general marketing or even something more personal about my journey. I’ve found that people have really responded to my personal posts – they don’t always get the biggest amount of traffic but they definitely get the most comments and I think they are great for connecting with your readers. Over the last two years, I’ve attempted to add more contrast to my content. It has often been said that content is king. However, with so much content out there it can all start to blend together so I’ve been focusing on making contrast king. This way, my readers look forward to what’s coming next. There’s more anticipation and surprise and, as a result, more attention and conversation is produced. 1. Publishing on weekends – CMI now publishes posts on Saturday and Sunday, as we’ve noticed that the posts get a bit more attention with less competition on those days. 2. Audio/Podcasts – Last year, we launched our first podcast and have seen amazing results. In the anticipation of more opportunities to get access to iTunes (ala Apple CarPlay), we are in the process of launching a podcast network as part of our core content offerings. 3. More In-Person Events – A decade ago, we were under the impression that social media might lead to people less likely to travel to events. Actually, the opposite has happened. With more networking going on via the Internet, people are actually craving more in-person, face-to-face time. So over the past two years we’ve added an event in Asia Pacific, as well as five additional events in North America. We’ve not really changed much at all with regard to our content during the course of the last couple of years. Since launching our corporate blog, we’ve always focused on just one thing: our audience. We try to write content for the blog that is informative, educational and which can help marketers (our audience) do what they do more efficiently, effectively and with fewer headaches. We try to stay on top of trends, tools, and must-know, must-consider things as marketers develop and execute their integrated marketing strategies. Much like you, we understand that relationships today are built with information, and by giving it away (information), people come to trust and rely on us as a go-to source for whatever it is they need. I use just one phrase as a barometer (and I use this when I’m on the road speaking as well): How do you know if you’re doing it right? Ask yourself just one questions: Is it good for people. If so, then you’re doing it right. I believe that applies to every facet of your content marketing and lead gen initiatives: website, landing page campaigns, blog, social, email, and is applicable both online and off. The last two years have been a time when we’ve experimented a fair bit with our content on numerous fronts including: 1. we’ve seen our longer form content do very well so have experimented with what we internally refer to as ‘mega-posts’ that are more comprehensive guides to larger topics. These posts are generally 2000+ words (and have gone as high as over 5000 words). While this isn’t what we publish every day we’ve tried to throw them into the mix ever few weeks and have been rewarded with great sharing, traffic and comments. 2. I’ve experimented increasingly with repurposing posts in different mediums. This has included using content previously published on the blog as slideshares and republishing older posts on LinkedIn and Google+ (usually with updates). I’ve also done it around the other way by publishing content that was still in a ‘first draft’ format to LinkedIn to get reader reactions before publishing it to the blog. 3. On ProBlogger we’ve also slowed our frequency down slightly and have been experimenting with ‘themed weeks’ where we tackle a larger topic over a series of posts over 5-6 days. This means we’ve been able to dig deeper into topics and build momentum. These theme weeks have been very well received. 4. The other major change for me has been the way I’m sharing content. I’ve put a huge effort into Facebook (on Digital Photography School) where we’ve gone from auto-posing new posts to 5-6 manual updates every day. The results of this have been amazing for us – while others are seeing reduced results with Facebook we’ve seen significant improvements in our organic reach, engagement and traffic driven from Facebook. I’ve become even more convinced of the power of brevity. I just made a change… this week! After 5+ years of writing two posts a week, I’m now publishing content every day. It wasn’t so much that I thought “more is better” — the old way was good for a while, too. But then it became stale and I felt like I wasn’t challenging myself. Just as important, I felt like I wasn’t serving my readers well. The new blog has a lot of more frequent, shorter content, as well as a new series of Reader Stories and Profiles to highlight some of the great people in the community. So far, I’m very happy with the change and I think the readers are too. I tend to go to longer content in social media and shorter content in blogs and direct response. I’m not sure why other than I use stories in social media and those tend to go longer. I don’t know that I’m using content for just education about ‘how to’ — but education about who I am and how I serve, how I live and how I see the world. I stopped sending newsletters monthly that were long and had multiple subjects to it. I found that they were not getting read. Now I send brief single subject emails weekly with very enticing titles to get open, click thrus and shares. This has resulted in much better open rates and easier content generation. More Long Form Content We are gravitating away from shorter more informal “blog” posts and are investing much more in creating lengthier, more authoritative articles. There’s a glut of blog content of the short style, and while it may be shared on social media widely, it also tends to have a short shelf life. Longer, more in-depth pieces on evergreen topics tend to deliver a better ROI on the investment (time or money) in an article. In other words, if you’re going to write an article, you might as well make the extra effort to make it rich in detail and fantastic! It’s not unusual for Small Business Trends to publish pieces I’ve personally written or we’ve commissioned from others, at 1,500 – 2,000 words each, several times per week. (We publish around 50 articles per week, since we are an online magazine.) We don’t have a steady diet of long pieces, but we do a greater percentage of them today than two years ago. Here is why we do more long-form content. We find that people AND search engines tend to favor well-written, in-depth pieces. For instance, Google recognizes Schema markup for in-depth articles. But even if you don’t know what Schema markup is or don’t want to bother with it, you may just find that longer content helps your site’s engagement because (a) people tend to spend more time on your site reading longer pieces stuffed with useful information; and (b) they are more likely to explore the rest of your site, not just consume a short snack and immediately go away. Also, a page with a lot of quality content on a specific topic tends to naturally rank well in search because of the sheer quantity of information for the search engine spiders. That means more people may find your article — and your site — via search. And perhaps hire you or buy from you. However, everybody has their own style, and every site is different. There’s no one-size-fits-all. I recommend that people experiment. See if long-form content works for you. My approach is much different now than in years past. When I first started out with my blog in 2006, I posted ten to twelve times per week, then a few years later, I brought on contributors in order to scale the blog, while I focused on writing for business media outlets. Now, I rarely publish on social networks and only write articles six times each year when I have new research I want to push out to the marketplace. Part of this is because I believe the marketplace is changing and part of this is because I burned out from posting so much. I have so much going on now that I would rather focus my content production when I need to get something out there rather than random articles. The biggest change for me has been that there are more outlets to share my content on. Specifically I think of Instagram. In the past the only way to share what I was seeing out in the world was in a blog post. Flickr has always been around as someplace to upload photos, but that is where it ended. There was no real community. But, using Instagram I can take a photo, tag the location and then write as little or much as I want and share it out to all other channels. I love having that flexibility and functionality right in my pocket anywhere in the world. I no longer have to take out my laptop to create and share. I’ve changed it all. I write once a week or so for chrisbrogan.com, instead of once or twice a day. Instead, I write my newsletter once a week, and write for private communities multiple times a day. I’m sharing a peek from outside, but only the faithful gets the payload. So, if you’ve made it to this point why not share thoughts on how your content marketing is evolving! March is Women’s History Month. Some 10.1 million firms are owned or co-owned by women, 40 percent of all businesses in the U.S., says the Center for Women’s Business Research. Between 2002 and 2007, women created almost twice as many businesses as men, according to data from the Census Bureau. Who would you list as your primary role models when staring and building your business? And why? Lisa: Vanessa Fox I didn’t necessarily look to her as a role model in terms of starting a business (though she’s done a fine job of that), but more as an example of how I wanted to conduct myself and be seen in my industry. Vanessa is the brain responsible for building Google Webmaster Central, but since then she’s gone off to start her own consulting firm, is ever-present in search, and is just someone who does things *right*. She does them for the right reasons and with her clients’ best interests in mind. And that’s important to me. It was also important to have someone in my sights who works just as hard today as she did before she became a success. She’s kept her head and she’s an expert at what she does. Who wouldn’t look to someone like that for an example? Do you feel you’ve been able to contribute something unique to your business precisely because you are a woman? If so, please elaborate. Anita: Usually I try not to dwell on gender, but as I look back I think being a woman made me work all the harder, and not give up. Whether real or perceived, I felt I needed to strive to be better than men in whatever I took on because I was a woman. Whether I really HAD to be better than my male counterparts or was in fact being treated differently is not the point. I felt that way — and it drove me. So much of our success in business starts in the 6 inches between our ears (i.e., in our own minds) that we become a product of what we believe. And so, because I believed I had to work harder, I did work harder. While I might never have been the most creative or the most brilliant, I can say that I worked harder than many to build my business. How would you characterize the differences between male and female business owners? Carrie: I would say that, for whatever reason, men do seem more driven to keep going while women seem to slow down their growth when they think it is ‘enough.’ Other than that, maybe I’m naive, but I don’t see that many differences. I do get the ‘how do I balance work and life better’ question more from women than men. So either men have that figured out or it’s not top of mind for them. I wrote a guest post for Anita Campbell’s Small Business Trends site titled – What’s Money Got To Do With It. The post explores the idea that too many small business owners don’t place enough value on what they do to charge what it’s worth. The post drew some pretty strong reactions – go check it out and add your two cents. Speaking of guest writing – I am contributing content and community involvement for the newly launched Business Exchange Community hosted by Business Week. It’s a community all about content and building out niche topic areas. Anyone can join, build a profile, and suggest topics. I’ve been busy working on the Small Business Marketing topic area. I think it’s a great place to read and catch up on some content you may have otherwise missed but I think there are also some opportunities for exposure and traffic for those who get in there and start and curate a topic area.